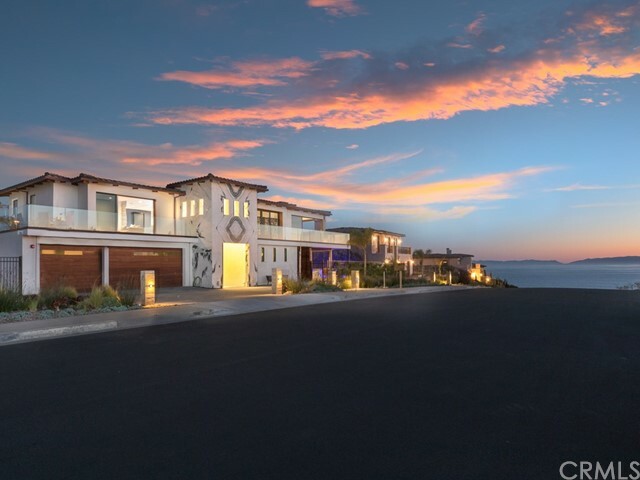 Modern masterpiece located on the cliffs of Palos Verdes at Trump National. The 6,000 square feet of open-concept living space enjoys 21 foot high ceilings includes five bedrooms and six baths (five en-suite). Massive wall of glass opens effortlessly to give you amazing views of the Pacific Ocean, Catalina and beyond. The smart home allows you to control the lighting, shades, audio, climate, and pool features all at a touch of a button from your phone or iPad. Builder spared no expense with the use of exotic stone and IPE iron wood. An oversized pivot door opens to a 21-foot tall cascading water wall and glass elevator. The impressive chef’s kitchen has an oversized floating island, Wolf industrial range, double door Sub-Zero and custom cabinets with the latest soft touch auto technology. The 1400 sq.ft. master retreat floats above the open living area and is positioned to take in the most amazing views. The exterior grounds have been designed to capture the alluring majesty of the sea with its zero edge pool and spa and outdoor kitchen with 40 foot long water wall. Just minutes away from the world-renowned Terranea Resort and Spa with numerous eateries. The home sits on Trump National, walk out your front door for a game of golf or dine at the 5 star restaurant. Steps away from the most scenic hiking trails with beach access, enjoy over 7 miles of prestigious coastline. Less than 30 minutes to Staples Center. We are including 1 year of free golf with a VIP Trump membership. © 2019. The multiple listing data appearing on this website, or contained in reports produced therefrom, is owned and copyrighted by Multi-Regional Multiple Listing Service, Inc. ("MRMLS") and is protected by all applicable copyright laws. Information provided is for viewer's personal, non-commercial use and may not be used for any purpose other than to identify prospective properties the viewer may be interested in purchasing. All listing data, including but not limited to square footage and lot size is believed to be accurate, but the listing Agent, listing Broker and MRMLS and its affiliates do not warrant or guarantee such accuracy. The viewer should independently verify the listed data prior to making any decisions based on such information by personal inspection and/or contacting a real estate professional. Listing courtesy of Jerry Yutronich from RE/MAX Estate Properties . Last updated Thursday, April 18th, 2019.